A recent concept image gives us an idea of what it might look like if Samsung decided to use an iPhone X-esque Notch with the Galaxy Note 9. This year seems like the year of Apple, as many Android phones are starting to emulate the iconic Notch of the iPhone X. The decision Apple made was certainly controversial, but it appears to have paid off as the X became the fastest-selling iPhone in history. Android manufacturers are trying to get on board, although Samsung seems hesitant to do the same with the Galaxy Note 9. It’s important to note that these concept images aren’t anything official, rather serving as a designer’s take on what the Galaxy Note 9 would look like with a Notch. Still, it’s an interesting creative exercise that helps give us a sense of what the iconic Note line would look like with his increasingly popular feature. While many smaller Chinese brands are making iPhone inspired devices, even big brands like LG and Huawei are jumping aboard and giving their own take on the Notch. The likelihood of a Galaxy phone including the feature – at least in this upcoming generation – is pretty low, as the company seems to have arrived at a design that works well for them. We did see from the lackluster sales of the Galaxy S9, however, that playing it completely safe may not work out for the company in the long run. While the Notch may not be the right decision for the Galaxy Note 9, they may need to change things up a bit with this upcoming generation if they’re expecting to keep with the trio of phones coming around the same time from Apple. These Galaxy Note 9 Notch renders come from a blog called Target YouTube. These renders, unlike many others, aren’t based on any existing Galaxy Note 9 rumors – rather taking some creative liberty to see what exactly the the phone would look like with this iPhone X feature. It’s nearly guaranteed that the final phone won’t look like that, but if the Notch is truly the way of the future, it’s possible it could become standard on Samsung phones in the future. Considering the controversial reaction to Notch, however, it’s more likely that it’s a fringe feature that will only become standard in a few companies as we move into the next few generations. Several reports have stated that the Galaxy Note 9 will look almost exactly like the Note 8, which is a little disappointing but not very surprising. 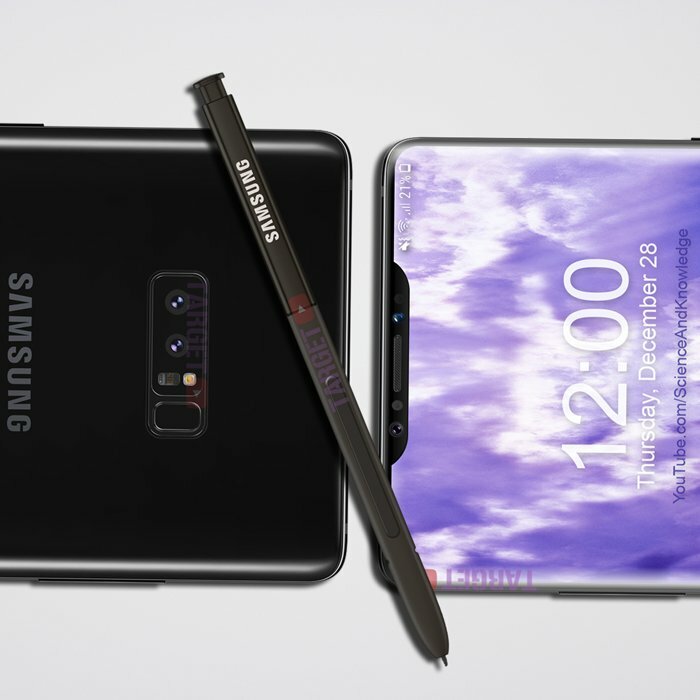 An email from a BGR reader turns our attention to Galaxy Note 9 concept renders created by a blog called Target YouTube. 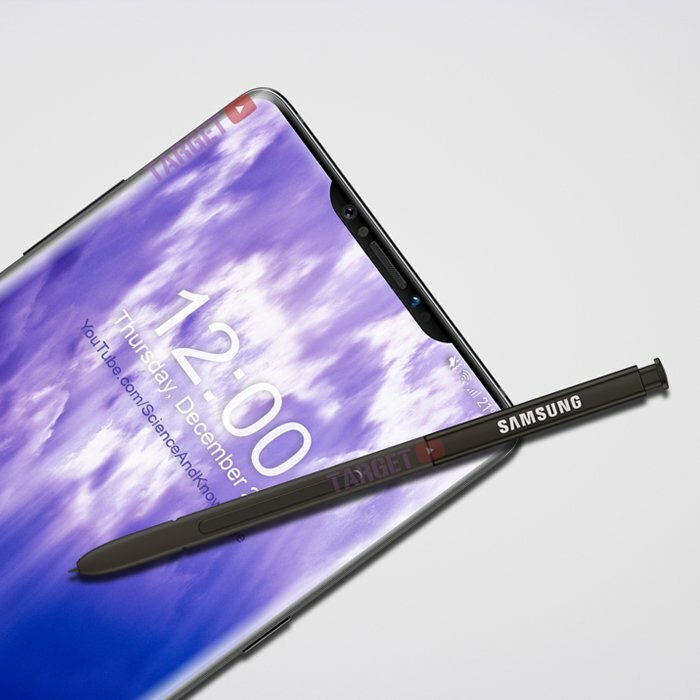 Rather than base the renders on actual Galaxy Note 9 rumors, the blog decided to create a Note 9 that borrows the notched display design Apple popularized with its iPhone X. While the Notch won’t make an appearance on the Galaxy Note 9, we can tell from this image that introducing such a feature may allow Samsung to reduce the size of the bezels both above and below their top-notch Super AMOLED display. With less bezel, it will be easier than ever before to get immersed in your phone – provided you’re not disturbed by the Notch, which is a feature that could potentially be distracting in and of itself. It’s important to note that while this concept image shows a potential notch in the Galaxy Note 9, a true notch on the phone would have to be bigger in order to house tech like the speaker, camera, and several different sensors that need to be included on the front of the phone. So even as a potential concept, it seems as if these pictures may be a little off the mark. Regardless, it’s an interesting mockup that makes us wonder if the Galaxy Note line will ever feature the Notch that seems to be becoming increasingly popular. As far as more realistic rumors about the Galaxy Note 9 go, many people are anticipating that we’ll see an in-display fingerprints scanner shipped with the new device. 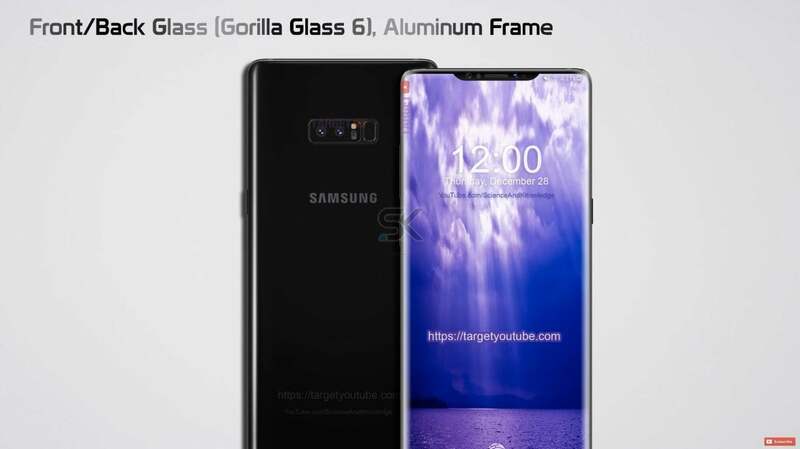 This would be a massive improvement over the current generation of Samsung flagships that generally have a fingerprint scanner on the back of the phone. As mentioned above, the bezels on flagships continue to shrink in order to maximize screen real estate – and the traditional fingerprint scanner is usually the first to go. By moving the scanner under the screen we could have a more convenient and aesthetically pleasing phone with the introduction of the Galaxy Note 9. If Samsung follows past trends, it’s likely that the phone will be released sometime in August. There have been rumors around the web, however, that suggest the release date may be pushed up due to lackluster sales of the S9. Either way, it will likely only be a few months before we have our hands on this new device. We shouldn’t expect a notch like that shown in the concept images, but we imagine it will be a phone that is as beautiful as it is functional.